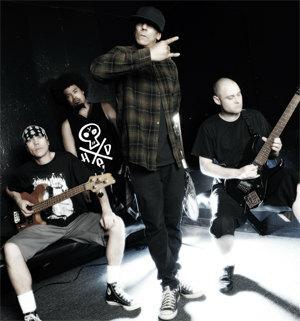 Hed PE is back with their ninth studio album to the delight of American Rapcore fans everywhere. Their latest offering, Evolution, is slated for release this July on Pavement Entertainment. Comprised of Jared Gomes(vocals), Mawk(bass), Jackson Benge(guitar) , and Trauma(drums) the band is back with sounds heavier than ever. Maximum Ink: What were you like as a child growing up? What would you say are your fondest memories of that time? Jackson Benge: I was a hyper kid. My grade school teachers would always write the same types of comments on my report cards; “He has a lot of energy,” or, “Distracts other kids.” I couldn’t keep still and couldn’t stop staring at the clouds. My imagination was my best friend and I used to love to draw. One of my fondest memories growing up was the first time I rode a bicycle without training wheels. As long as my memory is still intact, that will remain among the fondest. MI: How old were you when you wrote your first song? Do you remember what it was about? JB: I was about 15 or 16 years old when I wrote one of my first actual songs. Believe it or not, I wrote the lyrics as well. It was called, “Hold On,” and it was a cross between “Earth Angel” by the Penguins and “Don’t Cry” by Guns ‘n’ Roses. It was a simple love song about wanting to be with a girl you can’t have. At the time, many girls around me seemed to like that song, so I guess it was a relative success. MI: Are you excited to be releasing your ninth studio album on Pavement Entertainment? JB: “Evolution” is our 9th studio release and it’s always exciting to put out a new record, especially with a label like Pavement, which clearly has a solid grasp on how to treat their artists. The team we now have working with us is incredible. When I talk to others who have worked with Pavement, they have nothing but great things to say about them as well. MI: How does this album differ most from albums past? JB: Every album is said to be different from the prior, but this one incorporates a style that we have yet to showcase, along with some reggae tracks. The style we include on this one is similar to what is known as doom metal. But, to me, we’re really just paying homage to Black Sabbath. We started jamming on a couple of riffs that fit that description and it was obvious to us that this was an avenue worth exploring. MI: Are you looking forward to hitting the road with the rest of the guys? What is it like to work with them? JB: We are all partners in crime and have been through a lot together. We all know our places and have nothing but the utmost respect for each other personally and professionally. On stage, there is a chemistry that cannot be matched and can only be generated through time. MI: What do you think it takes to make a band that has lasting power? JB: We have some of the most loyal fans any band could ask for. They have stuck with us through thick and thin, so that’s the real reason we’re still here. From within the band, however, it takes communication and mutual respect. Those are the most important factors that contribute to any long-term venture. MI: How has the music industry changed most since you started working in it? JB: The economic downturn in 2008, I think, had a substantial impact on the music industry as it did with everything else. The increase in music downloading marked a drastic decrease in CD sales. Today, bands that chart high on the Billboard 200 aren’t selling as many CDs as bands that would have been on that same chart a decade earlier. The middle class seems to be dwindling, but the middle class equivalent of bands is also dwindling. All the money is moving in a different direction because there is not as much of it to go around. The result is that more bands get less funding and less tour support. So, more bands simply can’t afford to tour or put out a record and the ones that do get funding and support tend to get a lot of it. On the up side, so many bands now have an opportunity to promote themselves via social networking. There are smaller labels that offer services suitable to the artist, instead of suitable to the label. Evolving recording technology allows artists to handle more of the writing and recording in house, instead of relying solely on expensive studio time. Now more than ever, it’s all about being wise with your money. MI: Are there any little known things about yourself that your fans might be surprised to learn? JB: I do a really good Christopher Walken impression. MI: What projects are you looking forward to bringing the world next? JB: I would like to do some more solo stuff and maybe put together some side projects just so I can keep myself busy during the downtime, but it looks like we’ll be pretty busy throughout this album cycle, so we’ll have to see what happens. MI: What are your feelings on life and death and what happens after? JB: Life is a continuous process and animates countless vessels. No vessel is more important than any other. Death is merely a transfer of energy from one form to another. No one really knows what happens to us after we die, despite how sure they may think they are. Our behavior in life should be driven by what we truly know, instead of what we think we know. MI: How do you hope to be remembered when your time comes? JB: I only hope to be remembered as a good person. MI: If you could chose just one thing to do before you die what would that be? JB: I would like to apologize to everyone I ever wronged and ask for forgiveness. JB: It is always a pleasure to be offered the opportunity of expressing myself, whether through music or word. Thank you.